Harold Arlen (1905-1986) was an American composer whose songs appear in an amazing 50 musical productions for the stage and screen. He composed music for both Broadway musicals and Hollywood films, and even though many of his songs are quite popular and well-known, he himself is not. His main collaborators were the lyricists Ted Koehler, E.Y. Harburg, and Johnny Mercer but he also wrote with lyricists Ira Gershwin, Dorothy Fields, Ralph Blane, Martin Charnin, Dory Langdon, Howard Dietz, Leo Robin, Billy Rose, Jack Yellen, and Truman Capote. Arlen received one Tony Award and nine Academy Award nominations for best song, winning for what has been called the most performed song of the 20th century, the 1939 song “Over the Rainbow”. 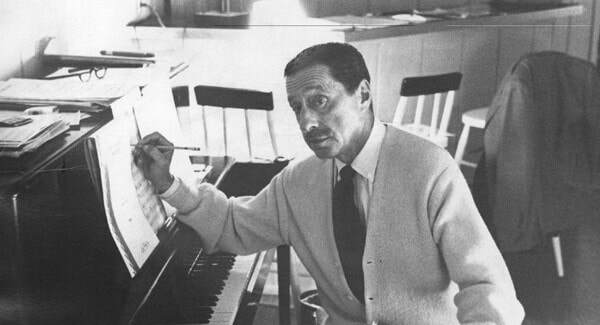 In 1973 Harold Arlen received the United States Library of Congress certificate of honor. In 1984 he was awarded the ASCAP Richard Rodgers award, and Los Angeles designated his birth date February 15 as Harold Arlen Day. ​Harold Arlen was born Hyman Arluck in Buffalo, NY, and began his music career in the early 1920’s playing piano, composing, and singing with his own small jazz group in the area. In 1925 he moved to New York City where he played piano for vaudeville and appeared occasionally as a band vocalist on records by The Buffalodians and Eddie Duchin usually singing his own compositions. Shortly thereafter, he met Ted Koehler and together in 1929 they wrote their first hit “Get Happy”, which Arluck published under his new name Harold Arlen (combining his father’s and mother’s names Arluck and Orlen). Arlen spent the next five years writing for Broadway productions with Koehler and producing some of the best known song standards including “I’ve Got the World on a String”, “Let’s Fall In Love”, and “Stormy Weather”. Based on the success of these popular songs, Hollywood came calling and in the mid-1930s Arlen moved to California to compose for movie musicals. He began working full time with lyricist E.Y. Harburg and, in 1938, the team was hired by Metro-Goldwyn-Mayer to compose songs for a new movie based on the L. Frank Baum novel, The Wizard of Oz. The resulting score, which included "Over The Rainbow", propelled Arlen into the top tier of film composers. In the 1940s, Harold Arlen teamed up with lyricist Johnny Mercer, and continued to write hit songs like "Blues in the Night", "That Old Black Magic", “My Shining Hour”, "Come Rain or Come Shine" and "One for My Baby". In the first half of the 1950's he composed for about two movies a year while he socialized with his composer friends Ira Gershwin, Jerome Kern, Irving Berlin, et al. His last popular song, "The Man That Got Away" was written with Ira Gershwin for the 1954 movie A Star Is Born. Shortly thereafter he returned to New York and Broadway and worked with many New York lyricists and writers including Truman Capote, Martin Charnin, and Dory Langdon. ​Harold Arlen continues to this day to be a fairly unknown composer of arguably some of the best known song standards ever written. Many people have tried to explain this obscurity with little success. One theory is that this anonymity can be attributed to a 20 year sojourn in California where he was overshadowed by stars, and another to his genuinely shy and modest demeanor. Whatever the reason, Harold Arlen accumulated one of the most impressive catalogs in the history of American popular song, composing many songs which have become song standards for the ages.